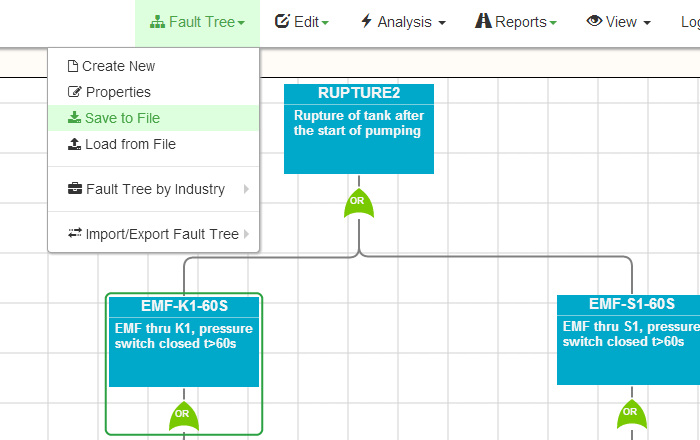 The fault tree analysis tool is provided for free. You may create fault tree, calculate probability, get the reports and save the fault tree to your own PC for future use. 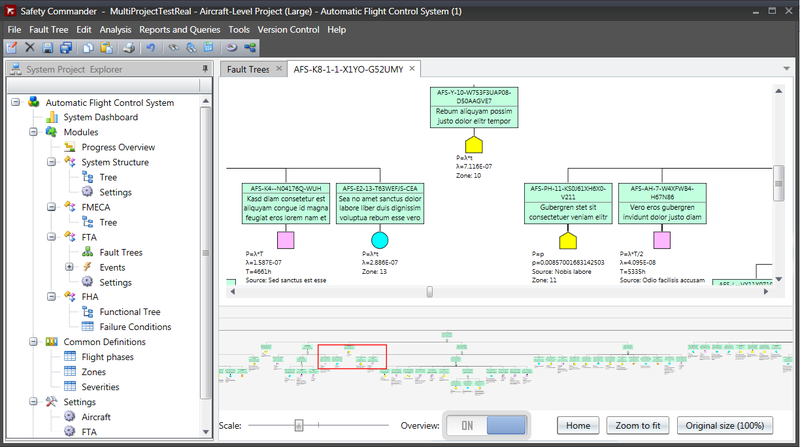 There are no limitations in the functionality of the tool or size of the fault trees you may build. You may download and upload fault trees you build to and from your own PC. You may start using the tool right now, from your tablet or PC, using any operating system, without a need to download or install the tool – it is web based! You are one click from using free unlimited, web-based fault tree analysis solution powered by ALD. Your fault trees are stored on your PC. Steady-state and mission time calculation. You may build fault tree with OR, AND, K-out-of-N (voting) gates and different tipes of basic events, including Evident, Latent, External, Repairable and Unrepairable. 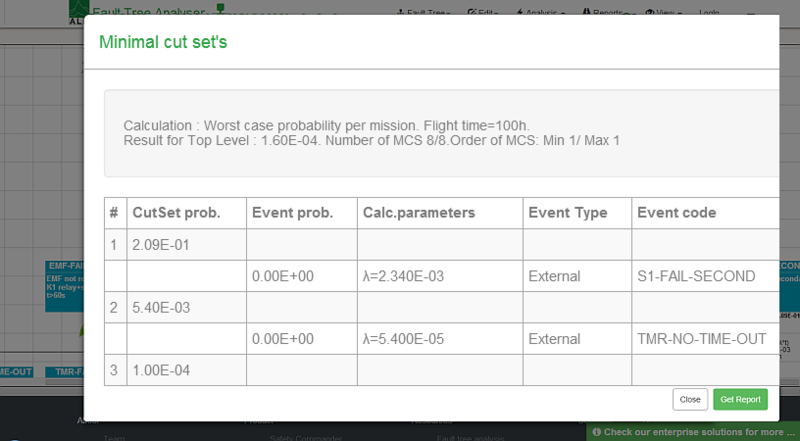 Calculate your fault tree probability/unavailability (including events and intermediary gate probabilities) for Mission time (with defined mission duration) or for Steady-state mode. 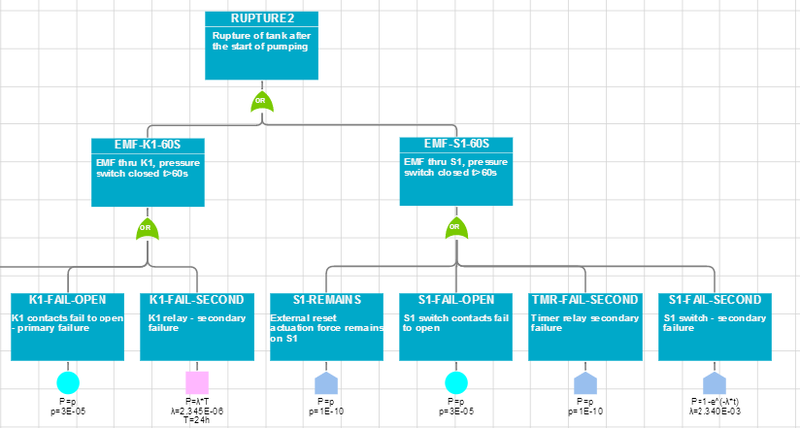 Generate and download reports for your fault tree – list of Minimal Cut Sets, list of fault tree events and gates. When you finish building your fault tree, download it to your own PC. 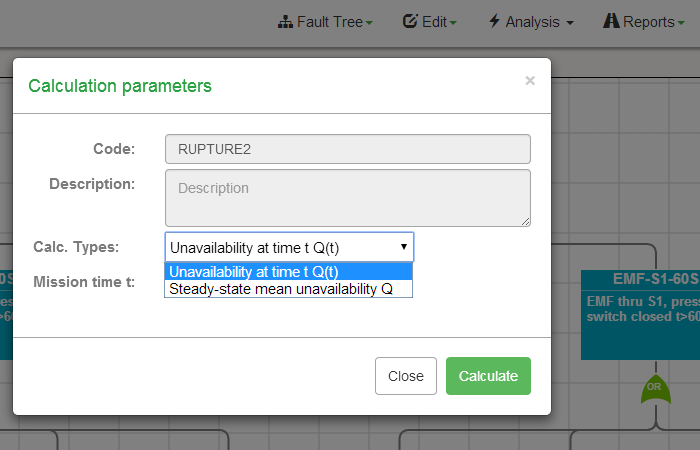 Upload it back to our Fault Tree Analysis tool when you need to work with this fault tree again. You may download, store and upload unlimited number of fault trees on your PC. This way, you are in charge for your information, it is not stored on our servers, no risk to loose condifential information. The Free Web Fault Tree Analyzer is provided in "Software as free service" mode. It is installed on and powered by our infrastructure and IT, is available worldwide and free. You do not need to install anything. All what you need to have in order to use it is a compatible web browser and FT analysis basics knowledge. ALD Reliability and Safety Solutions has been working in the field of reliability, safety and quality of the safety-critical and mission-critical equipment (mainly aerospace, defense, transportation and telecommunications) for more than 25 years. We support the promotion of System Reliability and Safety and wish to make it more accessible for reliability and safety engineering practitioners and students . Will it be free forever? Currently it is free and there is no plans or intentions to change that. It is possible that in future we will charge money for extensive usage of the tool or usage of additional advanced functionality – however basic functionality will always stay free. Can I trust the calculation results? The calculation engine used by the Free Fault Tree tool is the same as engine used in our commercial products – it was tested, validated and used by hundreds of customers worldwide. May I upload fault trees created in CAFTA, Isograph or RAM Commander? You may switch to our commercial tools like Safety Commander and RAM Commander which have capability to import fault trees from the mentioned above and other software packages. Where should I download the tool and how to install it? No need to download or install. It is web-based tool, so just start using it inside your browser now. What if I need to build fault trees while I do not have internet connection? In this case you need to switch to one of our commercial Fault Tree tools like Safety Commander or RAM Commander . They may be installed on your laptop and may be used locally without internet connection. What if my fault trees are classified/confidential and I can't rely on web-based tool? In this case you need to switch to one of our commercial Fault Tree tools like Safety Commander or RAM Commander. They may be installed on your organizational infrastructure and this way you will do not expose sensitive information. Do you provide other free tools? Yes, we have Free MTBF Calculator for reliability prediction, and we also provide "Student" versions of our commercial tools for educational institutions and students – please contact our sales. I need to perform FTA or FHA or a complex system and I do not know how to do that. Can you help?